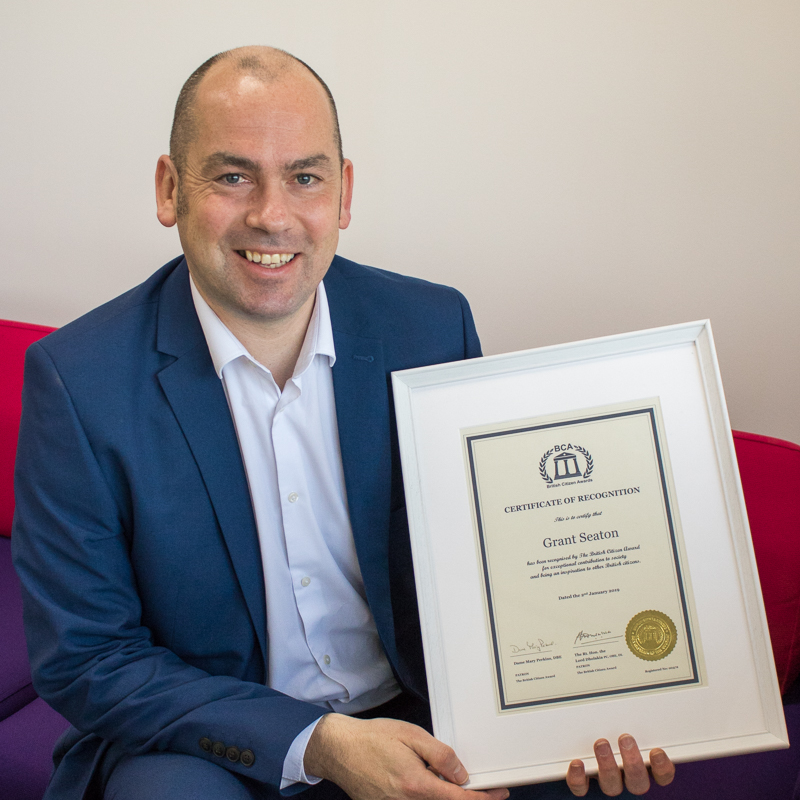 Grant, one of our senior business lending managers, 42, has received a certificate from the British Citizen Awards - one of only 60 given to people in the UK - after he was nominated by Jigsaw for his fundraising efforts. His achievements completing so many half-marathons around the UK, running over 140 miles in the process are all the remarkable when you consider that Grant’s running and training has been severely limited at times by colitis and IBD. “I was diagnosed in March 2017 and went from running 45 miles a week to not being able to do more than a mile at a time,” he said, adding: “They were able to help me with steroids, but I had another flare-up hit me again in September. Grant, who works as a business lending manager for the Cumberland Building Society at its Kingstown headquarters, was able to raise £7,700 for Jigsaw with his string of half marathons that took in London, Newcastle, Glasgow, Edinburgh and several points around Cumbria before concluding with Carlisle’s Great Cumbrian Run in October. He also organised a race night at The Halston hotel with Emma Lindsay of NXT Recruitment and spoke at Jigsaw’s open day about the ‘Pay for a Day’ which encourages people to fund a day’s care at the children’s hospice which costs £2,186. Grant said: “Every year I like to work with a charity and it was great to help Jigsaw this year. They’re not as well known as the Eden Valley Hospice so I wanted to inspire others to ‘Pay for a Day’ too. So what’s next for our the Cumberland’s half-marathon man? This year Grant’s chosen charity is the Carlisle Youth Zone and as well as a couple of half-marathons he has big plans to work with young people there on a project linked in with the Carlisle Fringe. “What they’re doing at the Youth Zone is amazing, building up the self-esteem of the kids and trying to inspire the kids to better themselves. The kids are absolutely brilliant and we’re hoping to help them get involved in the Fringe and promoting it,” Grant said. Grant’s colleagues at The Cumberland have been suitably impressed by his running exploits. His manager, Simon Whitwham, head of Cumberland Business, said: “What Grant did last year was nothing short of extraordinary. Natalie Bingham, Corporate Relationship Co-ordinator at Jigsaw, said “We would all like to say a huge thank you to Grant and everybody who supported him during his year long fundraising for Jigsaw in 2018. "Grant’s incredible generosity and support really will make a difference to all the children and young adults at Jigsaw as they Pay For a Day of Jigsaw care. “Pay For a Day is a unique opportunity for every individual, family, company or organisation in Cumbria to make a real, immediate contribution to the care of children and young adults with life limiting illnesses.